Athletico eased their relegation worries with a staggering 7-1 win over Ealandians who themselves sit precariously in 11th. This was a six-pointer and Athletico took full advantage of their attacking threats as skilful sharp-shooter Mohammed Qasim notched four goals to take him to 23 goals for the season with his colleagues Mohammed Raaj, Mahine Malik and Sajid Ali each adding a goal to seal the victory. This win moves Athletico one place in the table to overtake Wibsey but, more importantly, they are ninth with a four-point gap created between them and second-to-bottom Ealandians. Farsley Celtic Juniors continued their incredible form as they won 9-1 against relegation-threatened Wibsey. Farsley have now scored 88 goals and have a staggering goals difference of 77. Farsley led 4-0 at the interval. The goals were shared by Louis Surtees, who netted a hat-trick, Danny Lyons with two, Craig Farrand with two, and Joe Firth and Andy Shields with one each. Farsley now look set to win the title. Grangefield beat Alwoodley 2-0 away from home as they cemented their position in third place. Shane Gaunt got a brace in this fixture as he secured all three points for the visitors. The game was won by an excellent defensive display from Grangefield’s man of the match, Danny Allenby, who didn’t give Alwoodley’s defenders a sniff. 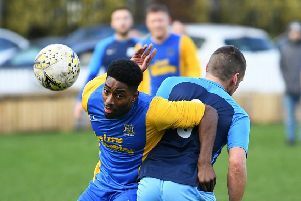 Leeds Medics overcame Calverley United 3-1. The Medics are positioned in fourth but they have several games in hand on the teams around them. Medics were two goals up after 25 minutes as Brad Chambers hit a brace. Man of the match, Tom Hird, reduced the arrears for Calverley with a shot from 12 yards which found the bottom corner. Francisco Matos bagged the decisive goal for the Medics as he put the game to bed and sealed the 3-2 victory. Drighlington kept the pressure on leaders Farsley as they strolled to a 3-1 victory, away to Horsforth St Margaret’s. Horsforth were two goals down at the interval as Drig’ controlled the first-half proceedings. Nathan McDonnel gave Horsforth some hope as he pulled one back but Drig’ made it three with their goals coming from James Bradd, Brett Thompson and Carlton Binks. Stanley United defeated rock-bottom Stanningley Old Boys 3-2 in a close encounter. Stanningley went in at half-time a goal up, against the run of play. In the second half, there was a complete turnaround as Kieran Wright, Stuart Davies and Nathan Smith gave Stanley the points. Adam Pulford hit a late consolation goal for Stanningley. The result of the afternoon came in the Championship as league leaders Gildersome Spurs Old Boys dispatched third-placed St Bedes 7-3, away from home. Bedes started extremely poorly as they were 3-0 down after 20 minutes. Bedes’ goals came from Alex Green who scored two and then leading scorer and man of the match Jermaine Moyce got one. The Spurs scorers were Matt Jackson, with a hat-trick, Steve Wales, Ben Keedy, with two, and Lee Thrush who finished the job off.